These fun, posing servicemen provide inspiration to soldier on through your basic (yoga) training. This troop's mission? To keep inner peace. Designer Dan Abramson looked to a favorite childhood toy to help inspire grown-ups to get into yoga. Armed with a general knowledge of the practice, this platoon of posing servicemen show off their secret weapon: major strength and flexibility. 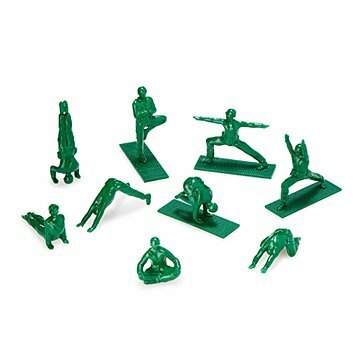 Give the battalion to the disciplined yogi or well-balanced lieutenant in your life, or keep them in your barracks as a reminder to soldier on through your basic (yoga) training. Packaged in a "mini yoga studio" box with a bamboo floor. Made of ABS plastic in China. Learn more about how Yoga Joes are bending stereotypes and starting a movement on our blog. Toy inventor Dan Abramson has taken an interesting approach towards promoting the practice of yoga. He’s created Yoga Joes, which are classic green plastic army men who’ve traded their guns in for yoga poses. Abramson made Yoga Joes because he thought it would be a fun way to get more people into yoga. Beyond that, he wanted to make a violent toy become peaceful. Was for a very thoughtful yogi who appreciated the symbolism and also the 'correctness' of each pose. To be a conversation starter at my husband's office (on a military base). I bought this for a friend who works for the military (and loves it). She's also really into yoga. This was basically the ideal gift. They came out exactly as advertised and look like the perfect desk adornment! I am reviewing this product in the hopes of getting the advertised $1000 gift card. That said, I just loved these the moment I saw them. I'll probably get more for others in the future. My friend is into yoga & green army men. This was the perfect goofy gift. These are larger than normal green army men, which makes it easier to decipher which poses they are demonstrating. For the guy who has everything. Great for on a desk. We'll see if he can get the poses. He has his old uniform, but I doubt he'll go that far.